I've received lots of emails lately from folks who want to visit Banff National Park this year. I hope I've provided them with useful information. To expand on that information, I thought I'd write about my most recent trip to Banff and lace it with even more useful info as well as the general experience. 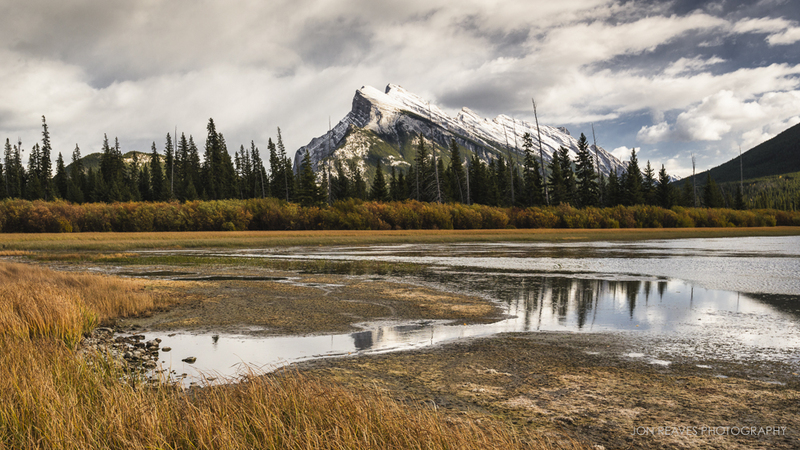 The Canadian Rockies are an amazing place in every season, and I love sharing my experiences with people who care. When someone reads this blog or views my photos on social media and decides they want to experience that place, too...well that's what Maps & Cameras is all about! My wife and I took a trip to Banff a couple weekends ago. Partly, so she could experience some non-urban winter scenery, and partly, of course, so I could get some nature images. On the snowiest day that Edmonton had seen this winter, we drove down to Calgary and then over to Banff via the Trans-Canada Highway. Arriving in the town of Banff just before sunset, we took Vermillion Lakes Road in hopes of capturing a stunning sunset over Mount Rundle. Unfortunately, I hiked across the frozen lake in two feet of snow for little more than a few seconds of pink light that was snuffed out by a huge dark cloud in the west. After the 4 hour drive, I was beat anyway and ready to check in and relax. We got a great deal on a room at Canalta Lodge - a relatively new hotel with hipster-modern decorating and a decent breakfast. We then had the worst and most expensive "Chinese" food ever at an establishment we'll just call Me No Wonton Soup or Thai a Rope Around My Neck if I Ever Choose to Eat Here Again. I actually walked over to McDonald's afterwards (my first Micky D's since moving to Canada last June). The following morning we were up early and driving along the Trans-Canada Highway through Banff National Park. Just before sunrise we reached Castle Junction. 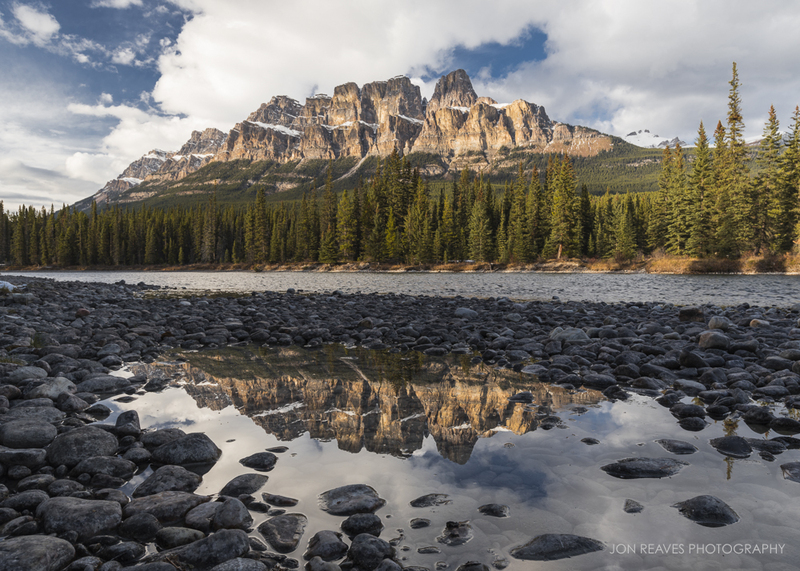 It's the premier spot from which to photograph Castle Mountain and Eisenhower Peak. I pulled over behind a few other vehicles- both photography workshops. We entered through the gate at the bridge that connects the Trans-Canada to the Bow Valley Parkway and quickly began looking for a composition. There were several other photographers walking around, but I managed to find clear shot of the mountain with the river below and an unspoiled snow bank that created a nice leading line. The bright pink morning light came in just minutes and lasted only minutes. Just as I was about to take my image during the apex of the light, a little man in a bright orange jacket popped up from behind the snow bank! He was right in the middle of my shot! He didn't speak english, but I was able to coax him into kneeling out of the way with some internationally recognized hand gestures...(something that looked like picking up a small child and placing it out of the way). I got my shots and we moved up the river after the light faded. The other photo workshop was packing up, so I decided to make a few more exposures even though the light was gone. Castle Mountain is an amazing scene. 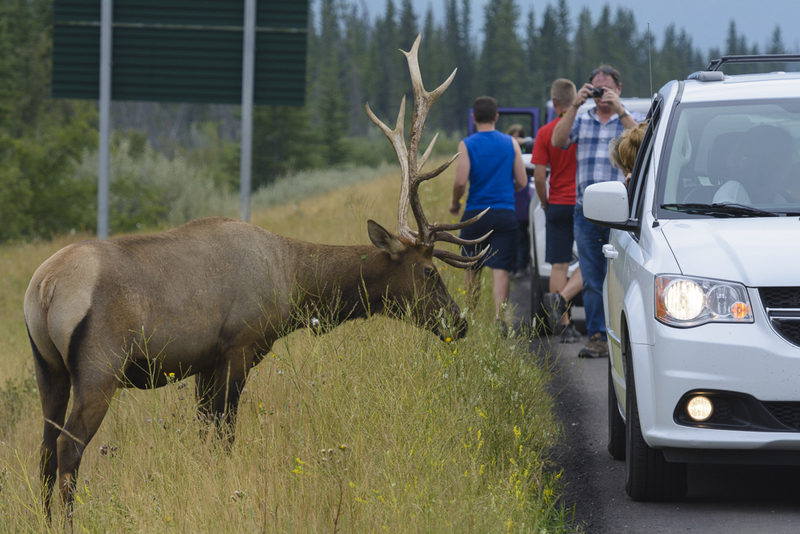 A short distance later along the Bow Valley Parkway, we spotted two bull elk in Moose Meadow. The snow was deep, so the elk were having to dig through it with their hooves to get to the grass beneath. I spent about a half an hour photographing the closer elk with my 200-500mm lens while standing knee deep in snow. 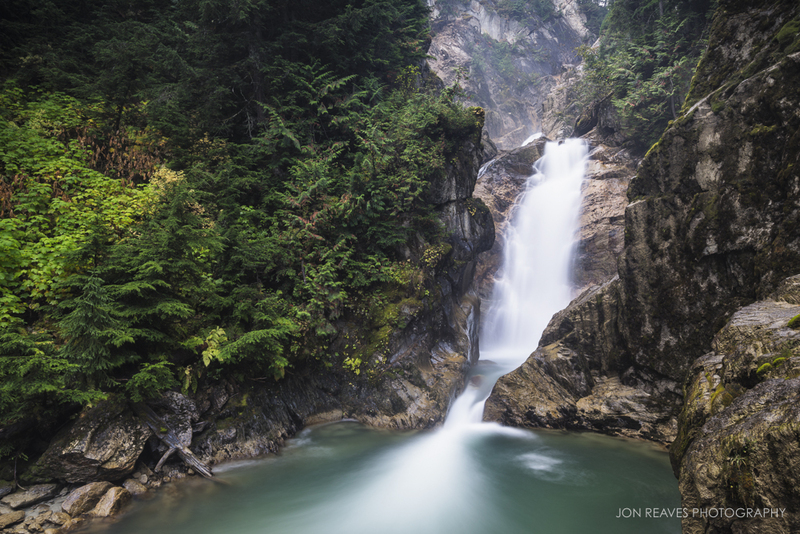 The next stop was Johnston Canyon. We hiked on hard-packed snow in crampons to the falls, but I didn't take any shots. It was beautiful in the winter woods and the frozen waters in the canyon were stunning and irridescent blue, but by mid-morning there were just too many people. Pretty tuckered from a morning spent hiking in the snow, we drove over to Moose Meadow to have lunch. The elk were gone and it was beginning to snow harder. I got out my little Primus camp stove, set it up on a level spot in the snow, and boiled water for tea outside while watching the snow fall on evergreens. Not a bad spot to have lunch! We decided against visiting Lake Louise. Visibility was low due to the snowstorm and we could see traffic backed up at the off-ramp to Lake Louise. In winter you can rent ice skates and skate on the lake, but the crowds and weather made that a much less desirable activity for us. 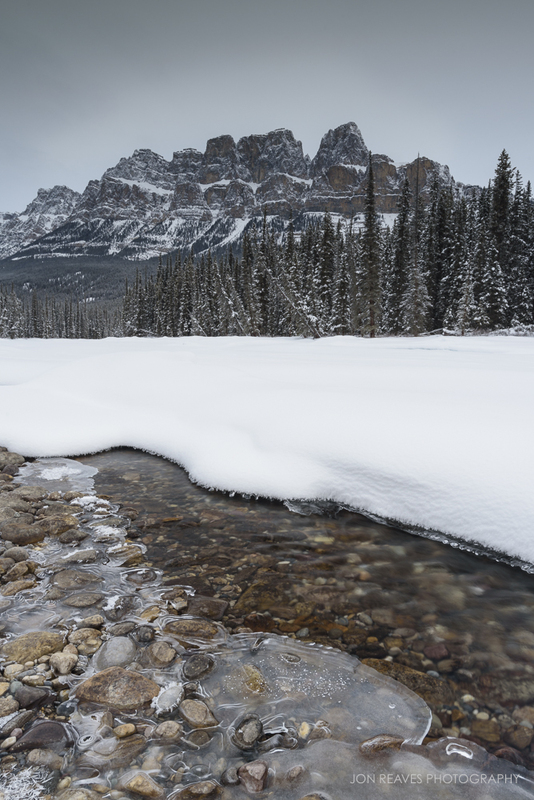 Despite the weather, we continued on to Yoho National Park on the British Columbia side of the Rockies. We managed to find the Natural Bridge and followed the tracks of other hikers to the stone arches. The river was frozen so we could easily enter underneath the bridge. The waterfall within it had frozen solid, but we could still hear the roaring of rushing waters behind the thick wall of ice. The rock formations made for interesting photography. A short drive down snow-covered Emerald Lake Road brought us to Emerald Lake. Snow and cloud cover provided little to no visibility of mountains, and the lake itself was covered with snow. There were also lots of tourists and cross-country skiers. I didn't expect so many tour buses. We hung around until most of the buses left, then I was finally able to get a few shots of the pristine snow-covered forests. They would be my last shots of the short trip. Due to worsening weather conditions it was obvious there would be no sunset that evening. We drove back to the town of Banff for a nap and had our first good meal of the trip at Magpie & Stump. We woke early. Peaking out the window I could see that the weather had still not let up. Snow covered the streets of Banff, and a few poor souls without proper winter tires were sliding through stop signs. The potential for capturing a colorful sunrise looked pretty low, so we took our time in the breakfast room at the hotel and headed back up to Edmonton in much better weather. 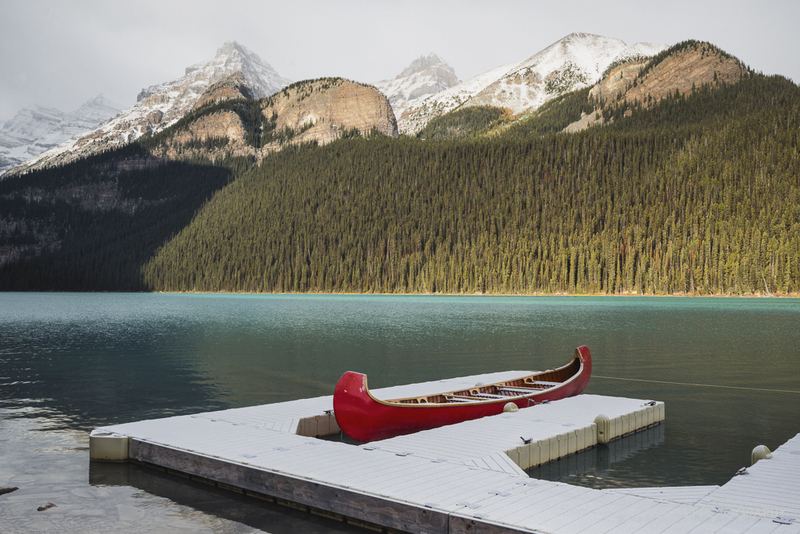 One short weekend in Banff is not enough. 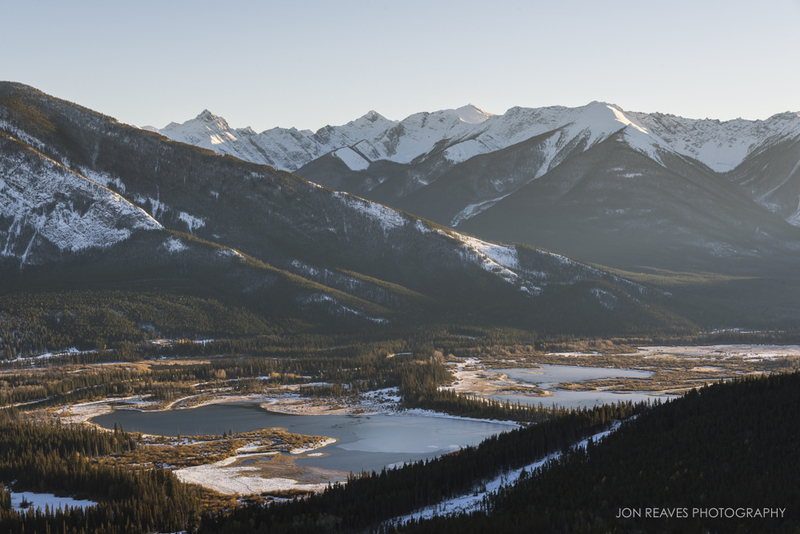 I managed several good images, but winter (or any other season) in the Rockies is too beautiful for short trips. I can't wait to return for longer and include Jasper National park in the mix as well. Thanks for reading and happy travels! Read more on Banff National Park here.